Mar Makarios Thirumeni is our bishop, our guide and guardian. This picture was taken at the annual Diocesan Meeting held in Philadelphia July 2005. The Mission Society of St Gregorios of India was present with parish representatives from Washington (state), Wisconsin, New York and Florida. "His Grace Dr.Thomas Mar Makarios, Senior Metropolitan of America and Metropolitan of Canada and Europe, a native of Kerala, India, was born on May 26, 1926, the son of Mr.Chacko and Mrs. Mariamma Kuttikandathil. After attending schools and colleges, he completed theological studies at the Orthodox Theological Seminary at Kottayam. 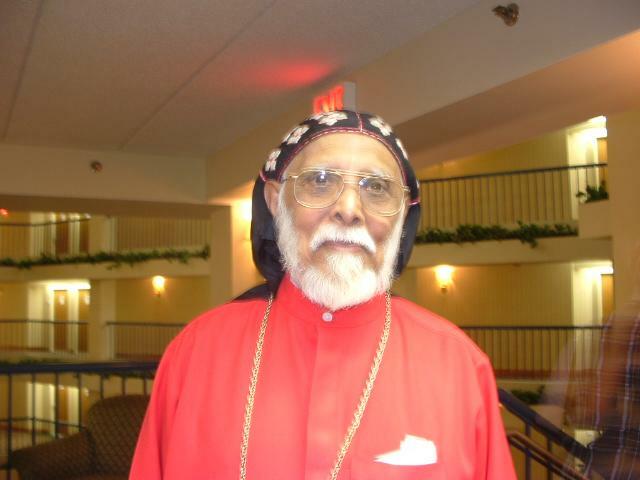 He was ordained a priest in 1952 by His Holiness Catholicos GeeVarghese Baselios II. He came to New Delhi, the capital city of India, and organized congregations in North Indian cities. He became the first vicar of Orthodox Church in New Delhi. "It was during the time of the litigation of the Church that Mar Makarios showed his ingenuity as leaderand scholar in Church History. He helped the lawyers of the church understand the history, traditions and Canons of the Church. This was instrumental in seeking an historic verdict by the Supreme Court of India in favor of the Church in 1958. Mar Makarios has studied in various religious institutions in England, Germany, Switzerland and France. He has been in the U.S since 1963 and earned a Bachelor of Divinity degree from Nashota House in Wisconsin, a Master's of Sacred Theology from Virginia Theological Seminary, and a Doctorate in Theology from Union Theological Seminary in Richmond. He returned back to India and worked as a professor of Church History at Orthodox Theological Seminary in India. In 1975, Mar Makarios was consecrated as a Metropolitan by His Holiness Catholicos Eugen I. In the same year. The Catholicos appointed Mar Makarios the first metropolitan of Diocese of Bombay. "In 1979 Mar Makarios was installed as the first metropolitan of the Dioceseof America of Indian Orthodox Church. Since 1985, Mar Makarios has been teaching religion at Alma College in Michigan. Although he is busy year around as senior metropolitan of his church in western hemisphere, he sets aside the time to come to Alma College. He believes that he can help give students a deeper insight into the `mysterious' insight of the Eastern Church. Inrecognition of Makarios's achievements and contributions tochurch and society, the college awarded him the degree of Doctorof Divinity Honorees Causa in 1990. In 1994 Mar Makarios wasappointed as the first metropolitan of the newly created diocese of Canada and Europe. "In 1995, Mar Makarios was appointed as senior metropolitan of the Malankara Orthodox Church in America. Mar Makarios is a great teacher and defender of Orthodox faith. In guiding the Church in the western world into the third millennium, Mar Makarios has superbly evincing a rare and high order of vision, courage and foresight."